This is the latest treasury I created. Lots of gorgeous Etsy sellers and their lovely items. Although the treasury is almost feline I started with that woodpecker fledgling right in the middle. What a great and funny photo! It's from MNHPhotography. I guess, I've to get it. Check out the complete treasury as long as it's alive! 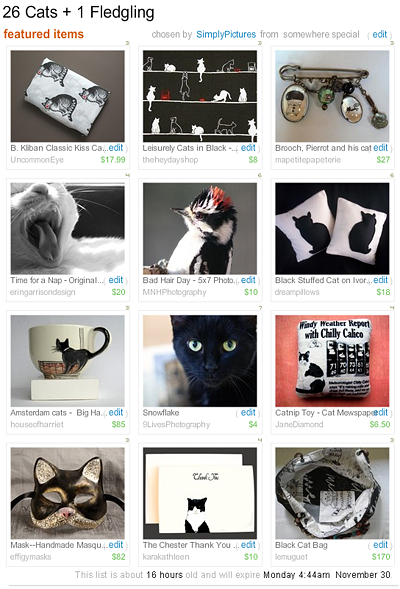 BTW, the idea to mention this in my blog I've nicked from Erin Garrison whose lovely yawning white cat is featured in this treasury, too. She has mentioned it in her blog earlier. Thank you!